What do I do about Dogs Chasing my Horse? Any tips on what is the correct and or safest thing to do when riding out and you are chased by dogs, sometimes 2 or 3 at a time that usually come rushing out of a driveway? Also many thanks for all the info you have shared over the years through your books. Because of you I have safe horses and have had wonderful experiences. It is great to hear my books have been helpful ! I talk about dogs in my books “How to Think Like a Horse” and “What Every Horse Should Know” so if you have those books, you’ll find some anecdotes with the late great Sassy one of my former riding horses. She was naturally a NO FEAR horse, very aggressive with other animals including big mother cows, llamas, dogs and even the wolf hybrids that used to live down the road from us. She taught me the most effective means of dog control was to wheel around and chase them all the way home and back into their driveway! She was not hesitant to kick a dog if it nipped her heels. So it was often kick, wheel and chase. Some horses aren’t wired to do that sort of thing naturally, but once I saw how effective it was, I taught some of my other horses at least the wheel and chase part. With those particularly sticky wolf hybrids I also carried one of those water pistols – the ones that you can pump and shoot a stiff stream of water quite far. It only took a couple of times and they learned to respect our space. With all that said, I guess I really should have started by saying step number one should be to call the owners of the problem dogs and ask them to keep them contained. However, in some rural areas, dogs are left to run loose whether the owners are home or not, so it is good to have a plan in place. Have a safe and enjoyable ride. i just got a 4 year old gelding and he’s very skittish – fast movements scare him. He’s out in a good sized area with a female who is 15. besides the fact that he is skittish, every time he starts to be ok with me and fast movements she bites him. it’s like she is trying to make him bad so she gets all of the attention but i do my best to love on them both. He is my first horse and i don’t know alot about them but i love them and it’s to the point that i want to slug her for biting him but she isn’t mine. also is there a way to get him to be ok with the halter? I really think he’ll be a great horse i just need help training him so he can be. What books of yours would be the best for me to buy? As far as the mare biting your gelding, that is part of the pecking order with horses. You can read about pecking order in this article – Pecking Order at Feeding Time. You ask if there is a way for your horse to be OK with the halter…..I’m not sure what you mean – do you mean haltering and unhaltering or leading or just general respect? Again, visit my main article archive and search some of your key words – there are a lot of articles there including a series on ground training a young horse, called the Sherlock series. 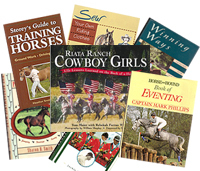 Finally, as far as book recommendations, you should probably read How to Think Like a Horse and What Every Horse Should Know and then branch out into the How-To books that are listed on my website. I have another problem. In October a crazy wind came and blew away all the leaves from the trees. The change in the way the forest looks freaked Dolly out, and she hasn’t been the same ever since. Just recently (like the beginning of this month) I’ll get to this place in the trail that is a telephone line right-of-way. It has two hills that are pretty steep and not the type you’d go cantering up and down. The second I come out of the forest trail and into this right-of-way, Dolly begins to try to gallop off with me. She’s become very agitated there. The first time I figured there was just a moose out there since I had seen three the night before. But its continued until she actually started to rear and leap and crow hop on me. She’s never reared before and its gotten to the point where its scary. I love her and I’ve put so much work into her, but I can’t figure out a way to get her to stop, trust me, and relax. She’s sending me mixed signals. I’ll ask her to move forward and she’ll throw a tantrum and buck and spin and rear, then when I stop her all she wants to do is paw through the snow and eat. So I know somethings not out there. Do you have any suggestions? I would really appreciate it if you did. Thank you again! You need to work on this at home first, then on the trail in “safe zones” and finally in those “hot spots”. First you need to be very aware of your own body language when these things happen. Even if you are alarmed when your horse starts freaking, your body, your seat, legs, back and arms and hands, and most of all, your mind, must be calm, cool and collected. Then you need to perfect a means of control and give the horse something else to do. You should learn how to do a one rein stop and then once your horse is stopped, ride her in a series of circles and half turns calmly and not in too-tight of a bend until her behavior de-escalates. You’ve halted her freaking behavior and given her something else to do. A one rein stop is different from a double which is kind of like a spin, what your horse does when she is frightened. In a double, the horse’s head and neck is turned rather sharply in one direction while his hindquarters are moving in the other direction. It is like a turn on the center. A one rein stop is just the rein signal. You want the horse to stop, not keep moving. A one rein stop is best done with a halter, bosal or snaffle bit as you will be using direct rein signals. To initiate the head and neck bend, reach down the rein close to the horse’s head and take up the slack. If your horse tends to spin to the right when she freaks, you want to work on this to the left. You’d grab the left rein and hold her into the turn until she stops moving her feet. Then yield – let go of the rein signal. Drive the horse forward with your legs and then do some gymnastics – circles, half turns, serpentines. Once you’ve mastered the one rein stop at home, you should set your horse up at home to “freak” and have your aids ready. You might have someone carry a strange item toward you or try and ride her past some balloons or an opened umbrella or waving plastic sack. Once you can control her no matter what happens at home, set up these same situations on a safe part of the trail. Each time and in each place that you control her and give her something else to do, it will build her confidence and make it easier in the next situation. Finally, ride to the trouble spot. It should be a piece of cake. But take the time it takes to perfect it BEFORE you go back to your trouble spot. Be safe and enjoy your horse.